Bristol technology firm joined sporting elite at the global Sports Technology Awards in London on 4th May. CricHQ, who recently acquired Bristol start-up My Action Replay, won the category for “best integrated digital media” celebrating innovation within the sports sector which significantly improves the users’ experience. 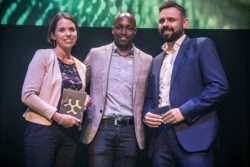 GB Olympian Marlon Devonish awarded CricHQ the trophy at the awards attended by industry leaders and international athletes. The Awards, a British initiative which attracts entries from over 30 countries, was hosted by sports presenter, Mark Chapman, and celebrated 19 categories, representing around 70 sports and over 100 brands, which had been judged by 32 industry-leaders including elite athletes, Dame Katherine Grainger, Baroness Tanni Grey–Thompson, Olympic rugby coach Ben Ryan and England Manager, Gareth Southgate. Fellow winners included Wimbledon, the NBA and the Tour de France along with a raft of other innovative sports and technology brands. CricHQ the world’s leading enterprise platform within Cricket, enables anyone to easily score games, and digitiseback-office administrative tasks that were traditionally labour intensive paper-based processes. With their recent integration with the video tech company My Action Replay, based at SETsquared Bristol, they enable clubs, schools, teams and fans to easily broadcast video of matches combined with in-match data and statistics with zero effort. CricHQ Chief Executive Officer Simon Baker said he was delighted with the win. “It’s fantastic to win this award, our passion is to digitise cricket to the benefit of all stakeholders and to create commercial benefits for cricket rights holders. The global broadcasting landscape is in a state of change and this creates a huge opportunity for CricHQ, our clients and 500 million online fans around the world who consume sport differently than previous generations. This award serves as great encouragement and recognition that we are on the right path by integrating video and audio into our platform. “The calibre of previous winners and other shortlisted nominees for 2017 is a testament to how the sports-tech sector is taking off internationally, and that’s exciting to be part of,” said Simon. My Action Replay Founder Emily Kent, who represented the company at the awards with European Sales Manager Stewart Reynolds, was delighted with the accolade. ICC CEO and awards judge David Richardson said CricHQ had driven crucial technological advancements in Cricket.